With the recent observation of the MLK Holiday and with Black History Month coming up, I’ve been thinking a lot about the people who came before us. Men who suffered through some of the most inhumane treatment in recorded history, yet fought fiercely to preserve their families. Women who after being raped by their master’s had to care for his white off-spring instead of their own. People who had to risk their lives so that their children might live in a better world. Then I look at the current state of Black America and I wonder what they must be thinking of us today. On one hand, we came together to help a Black man take control of the White House. On the other, we run over ourselves to pay a ridiculously rich Black man $200 for sneakers that were released 15 years ago. Is this the progress that those great men and women were hoping for when they took their lives in their hand to demand equality? Is this what Dr. King had in mind when he wrote on newspaper margins in an Alabama prison? I think not. I was born in the mid-1980s, raised in the 90s and came of age in the 2000s. 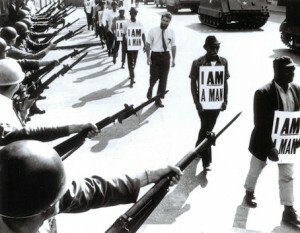 Needless to say that by the time that I came along, the Civil Rights Era was already written into the history books. MLK’s birthday was made a holiday shortly after I was born. Not only did we not know Jim Crow, but our parents never experienced it. Interestingly the next year my History teacher was a black woman, Ms. Gail Hooper . A proud, strong black woman with distinct physical features that displayed an undeniable connection to the Motherland. She often dressed in a manner that was very Afrocentric, even though that term meant nothing to me at the time. More important than how she looked or what she wore was what she taught our class. She dared to take Black History out of the sacred box of the month of February and sprinkled it in with the American history she taught the other eight months of the year. I think one of the most important moments of my life was when she showed us the PBS documentary “Eyes On The Prize.” I remember hearing the harrowing Emmit Till for the first time. I remember watching the Freedom Riders being attacked viciously while police looked on but did nothing. Ms. Hooper showed me that Black people have a history far larger than slavery and that the struggle for Civil Rights was far deeper than MLK’s “I have a dream” speech. Fifteen years later, the things that I learned in the classroom are still with me and continue to shape my thoughts and actions. As African-Americans move further from the bitter moments of our past, we must be sure that future generations know that they have reaped the benefits of those that came before them and that they have a responsibility to leave their mark. Everyone can’t be a Barack Obama, but everyone can be a Ms. Hooper.